Nigerian-born painter Njideka Akunyili Crosby's vibrant, large-scale renderings of everyday life can appear simple from far away (or online, where I first encountered her work). But her scenes of domestic life carry deep complexities in both form and content, tracing the artist's personal history as an immigrant, as a woman, and as an artist to create arresting depictions of intimate life: whether it's a shared quiet moment with her husband (Her Widening Gyre, 2011) or a table set for tea (Tea Time in New Haven, Enugu, 2013). 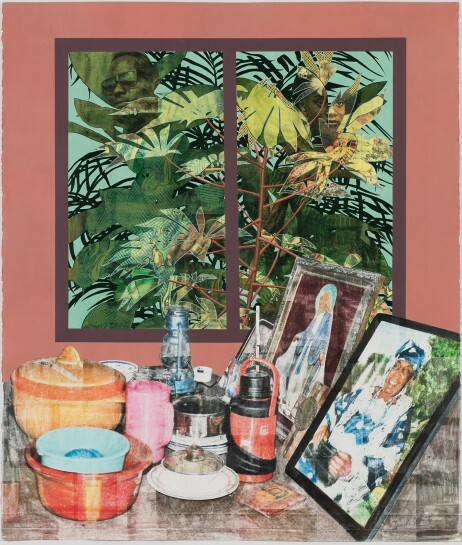 Akunyili Crosby's works are multilayered both in their materials (she uses paint, charcoal, pencils, fabric, paper transfers, and collage) and in their meaning — she explores questions of cultural identity, relationships, and geography through portraiture, interior space, and objects. I was instantly drawn to the way she uses textures like Nigerian portrait fabric and symbols like food labels or magazine clippings to weave together memories from her childhood in Africa and her adulthood in the United States, creating her own cultural touchstones in the process.Since receiving an MFA from Yale University five years ago, 33-year-old Akunyili Crosby has worked almost nonstop, building an impressive CV of prestigious art prizes and gallery shows across the US and in Europe. She has shown work at the Museum of Modern Art, the Norton Museum of Art, and the Whitney Museum of American Art, where Before Now After (Mama, Mummy, Mamma), 2015, was part of the Billboard Project in Manhattan. In advance of her latest show, Portals, at the Victoria Miro gallery in London (where she is represented), I talked to Akunyili Crosby by phone about her pop-culture fascinations, her switch from pre-med to art, and adjusting to her new life in LA, where she lives with her husband. Mannish Aggarwal-Schifellite: When did you decide it was time to pursue art as a career? Njideka Akunyili Crosby: In college I was going to be pre-med, so I was taking a lot of calculus and science classes. I wanted [to add] something light [to my classes], and that's how I took my first painting class. I ended up doing a double concentration in studio art and biology. By the end of my time at [college] I was on the fence about which way to go, and I took a year off, went back to Nigeria, worked for a year, and then decided I wanted to be an artist. I think what it came down to for me was a sense of urgency. This was in 2004 or 2005, and it was a very exciting time in Nigeria. There were just incredible explosions of culture with literature, with music, with Nollywood [the Nigerian film industry], with fashion. Different industries were booming and blooming, and people were doing incredible things. There was just this collective sense of feeling like our stories are valid and we're going to [tell them] and not make other people do it for us. I was so thrilled by it that I wanted to contribute anywhere I could, and art felt like a way to do that. MA-S: Location and culture really play into a lot of your paintings. You live in LA now. What's that transition been like? NAC: I came to LA two years ago [from the East Coast], and I'm finally seeing LA creeping into the work. The first thing I noticed was something about the color reflecting the lights of the place I was in. We moved into an apartment with big sliding-glass doors that overlooked the pool, and it reminded me of David Hockney. I started making works with plants when I was on the East Coast, but the use of plants in the work has kept evolving and developing since [I moved]. For a long time I used houseplants I photographed on the East Coast and a local root tuber from rural areas in Nigeria called the cassava. Then, when I arrived here, I decided to do more elaborate plant scenes, and I found myself walking around my studio, just photographing plants I saw. Plants can be markers of location and markers of place, but also sometimes markers of how people have moved from place to place. I think I'm getting to a point where I'm curious to see what happens outside the [interior] space I've been creating. I've been doing a lot of pieces with portals or openings into the outside world [using] a lot of windows and doors; that's where the gardens come in.